1989 Topps Traded Baseball is one of those sets that's dominated largely by one card. That's not to say it's a bad set. 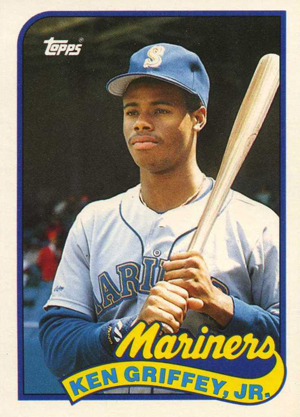 It's just one that over-printed, readily available and has a rookie card of one of the game's all-time greats -- Ken Griffey Jr. Distributed as a 132-card box set, 1989 Topps Traded Baseball keeps the clean design of the year's flagship set. White borders give way to a colored frame. The player's team is written in large writing at the bottom of the photo. Below it is the player's name written in a wavy ribbon. Card backs maintain the pinkish tone from the main set. However, these backs are much brighter as 1989 Topps Traded Baseball cards are printed on a white card stock. The Ken Griffey Jr. rookie dominates the set. Outside of the classic 1989 Upper Deck Ken Griffey Jr. rookie, it's seen by many as the legend's most attractive rookie. Other 1989 Topps Traded Baseball rookie cards include the overlooked Omar Vizquel and two-sport star, Deion Sanders. Randy Johnson is also in the set, however it's not a rookie as he was in the base 1989 Topps Baseball set. 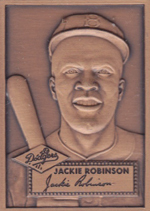 Given to dealers as an incentive for ordering cases of sets, this bronze mini card recreates Jackie Robinson's 1952 Topps rookie. Card measures 1 1/4" by 1 3/4". I HAVE FOUND A TOPPS TRADED KEN GRIFFEY JR METAL CARD THAT IS SERIAL NUMBERED OUT OF 1500. I CALLED TOPPS AND THEY REALLY COULDN’T TELL ME MUCH OTHER THAT THEY WERE FOR THE TOP DEALERS. CAN YOU PLEASE TELL ME ANYTHING ELSE ABOUT IT.